← The Sports Archives – Olympic Greats: 6 Amazing Paralympians To Inspire You! The Sports Archives – Redefining Urban Adventure: Rafting The LA River! 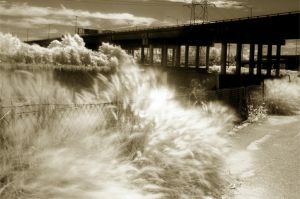 The Los Angeles River has gone from a moody giant, destroying homes with devastating floods to a wholly tamed force of nature, confined to a concrete tomb that would make John McPhee proud. It has played host to car chases, shootouts both cinematic and brutally real, as well as putrid sewage and a healthy amount of graffiti. Now, after years of confinement and abuse, the Los Angeles River is host to open to rafters, kayakers, and fishermen. The Los Angeles River is really less of a river and more of a mercurial giant. While barely a trickle in the summer, the river has historically reared head during the wet season. The late 19th and early 20th centuries saw rapid development in Southern California without the proper infrastructure (sound familiar, right?). With thousands of people living along an unpredictable river with few flood-control measures, catastrophe was inevitable. A 1914 flood caused over $10 million in damages and led to the creation of the Los Angeles County Flood Control District. After two more destructive floods in the 1930s, it was clear Los Angeles taxpayers weren’t going to be able to get the job done themselves, and federal assistance was required. Rather than build an elaborate system of dams and canals to control the flow as was originally planned, the Army Corps of Engineers opted to channelize the entire urban and suburban length of the river. Construction was completed in 1960, and Los Angeles could finally stop worrying about its river and start worrying about its riots. As Los Angeles grew more and more, the river became a metaphor for the strip mall formerly known as Southern California: Something once wild and beautiful, now fully-encased in concrete for the sake of development. As the river became more and more polluted and filled with trash, the graffiti piled up, and I wouldn’t have blamed you for writing off the Los Angeles River forever. Thankfully, Los Angeles has made great strides in working to solve its pollution problem, and the river has brought a few natural touches back to the concrete wasteland. In 2010, the US Environmental Protection Agency declared the Los Angeles river to be a “Traditional Navigable Waterway,” making it subject to Clean Water Act protections. The increasingly healthy river and its palpable pull in the middle of a hot asphalt metropolis prompted citizens to put pressure on their city council to open the river for recreation. Thus, the Los Angeles River Pilot Recreation Zone was born. The Los Angeles River is still technically considered a US Army Corps of Engineers flood control channel, and until this year was off-limits since the great depression. However, dirty water, trash, and the threat of jail time hasn’t been enough to deter some dedicated urban paddlers. Groups of so-called guerilla kayakers have been poaching the river for years. A screenshot of the car race in the LA River culvert from the film Grease. If you’re imagining yourself riding the mighty LA River through Long Beach and out into the Pacific Ocean, think again. City officials have not opened up all 50-plus miles of concrete-trapped nature. The Los Angeles River Pilot Recreation Zone is just that, a zone. But boy is it a pretty zone. Running through 2.5 miles of the lush Elysian Valley, the Pilot Recreation zone is the true definition of oasis. Shady trees, lush banks, a sandy riverbed, herons, and even trout all make you forget you’re in a major city. Los Angeles has provided other cities with a great example of how to use their resources. While it may have been necessary to tame nature to save lives, it is neither necessary nor just to keep people from nature. I can only hope that other cities in the west unlock their natural urban treasures for all to enjoy. Let us not forget that the story of the Los Angeles River is also a story of civic action. Were it not for the voices of the people of Los Angeles pressuring their leaders, we might still be staring at beer bottles and graffiti instead of herons and trout. Get out there and make your voice heard, you would be surprised at how many other feel the same way. The author of this article is Dylan Jones. If you enjoyed this piece you can follow me on Twitter @JakabokBotch. When I’m not writing about rediscovered rivers, I’m generally busy rediscovering my inner child somewhere in the canyons of the Wasatch front, or while going Colorado rafting. The Best White Water Locations in the USA! Take A Walk On The Wild Side: Extreme Sports And You! This entry was posted in Other and tagged adventure, car racing, Extreme Sports, Fishing, graffiti, Grease, guerilla kayakers, kayaking, los angeles, Los Angeles River, pollution, rafting, rivers, sewage, sports, sports and leisure, sports and recreation, Sports Archives, Sports Blogs. Bookmark the permalink. 2 Responses to The Sports Archives – Redefining Urban Adventure: Rafting The LA River!